It all began in a garage in the Gloucestershire countryside in 1995. Now 22 years and a whole generation later, The Authentic Bread Co. are hard at work, baking tempting Easter tarts and crossing hot buns just for us. Alan Davis; a telephone engineer for more than 20 years loved to holiday with his family in France, where his passion for real bread was born and he set about changing not only his career, but the way we bake and eat back home. He took to his garage, where he combined top-notch organic ingredients with care and patience to craft a real (authentic, you might say) alternative to what he saw as the mass-produced, lifeless loaves found in supermarkets. Fast forward to 2017 and the bakery is thriving in its new home a little way down the track on Strawberry Hill Farm. 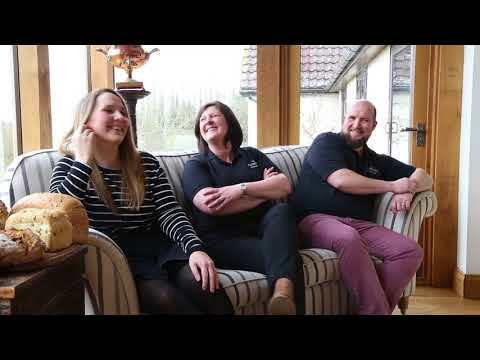 Alan is enjoying his retirement, safe in the knowledge that three of his children Emily, Sophie and Alex, share his passion for sustainable baking with no added nasties. "Bread's too often seen as just a way to get sandwich filling in your belly." Alex tells us while we watch his bakers expertly knead and shape the latest batch of their delicious new bake-at-home breads by hand. "Our aim is to make bread the main event again." And having tasted their results, dear reader, we think they may just have cracked it.